Control. The curatorial strategy traces the limits of the work, laying out a border to be filled, met, contested. The impulse of the artist to organize actions. Parameters, limits, and shifting positions of power. The responsibility of the curator in the production of performance. To curate. To collaborate. To let go. Cyclical: performing, programming, interpretation and imposition. Three invited artists are given the constraint/freedom to make work that employs the curator. Interdisciplinary artist Eleanor Barba grew up in the suburbs of Philadelphia, PA. She attended the Corcoran College of Art + Design in Washington, DC where she started taking off her clothes and making performance art. Her work revolves around the overwhelming idea of being sexually active in the 21st century. The tragedy of hook up culture can be traced back to hilarity. Eleanor's performances often uses text and her half-naked body to evoke the idea I'm naked but I don't want to turn you on. 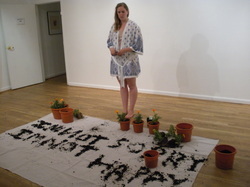 Eleanor has performed at the Corcoran Gallery of Art, Hillyer Art Space and Art@1830 in DC. She currently lives, works and gets regularly checked for STDs in Philadelphia. Interdisciplinary artist Adrian Parsons is an activist and performance artist whose work is based on aiding or subverting the body and its provocative interactions with systems. Parsons has shown at The Fridge, Flashpoint, NYC’s Dorian Grey and The Warehouse in an offshoot of the DC Arts Fair. His continuing Drone series began as an imagined post-apocalypse–through a POV helmet channeling the gaze of (yet another) curator–atop the Gansvoort Hotel roof during Art Basel Miami Beach in 2009. He has collaborated with SUNY Buffalo’s Matt Sargent in sound & video offerings and more recently founded the performance art team Kool Raunch Collective with dancer Sebastian Rousseau of Korzo Theater Den Haag. Last year he gained international attention for a twenty-five day hunger strike promoting DC voting rights. Interdisciplinary artist Kunj Patel’s roles are defined by activities in printmaking, sculpture, performance art, installation and curation. Kunj uses repetitive actions and ritualized behavior to portray the unstable identity that spawns from life as a first-generation American. He uses traditional Indian materials in American mannerisms or vice-versa. He explores the tense nature that may result, and the ideas of being stuck in this situation of no-identity or new-identity. 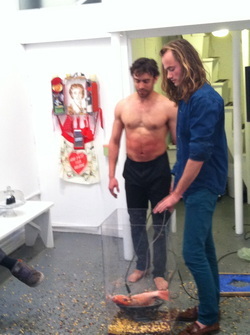 Through repetitive action, he builds gestural, and visceral forms inspired by the human body within a cultural context. His works have an undertone of sensuality, fetishism, and play, while engaging the audience in an array of emotions through interaction or un-comfort. I decided that I could program this series "Soapbox" at a gallery. Someone started it, and no one kept it going. Kunj was in the very first one, before I met him. I thought, I will learn to do it as I go- I'll just pretend that I know how to, as if I know artists in the area. At that time, fall 2011, I'd been in DC for almost half a year. In DC, then- when I said 'performance art' the reaction was either "you mean like juggling?" or "this one time, this guy Adrian, he like cut off his foreskin." I thought, ok, I need to first meet this man and second give people more to talk about. So I met Adrian, we got tea and I spilled my tea, and he agreed to perform in my program as Kool Raunch Collective. This was when Occupy was happening, and Adrian was living in a tent in McPherson Square. I visited his tent, heard his ideas, he began a hunger strike, and the live-feed was projected into the gallery for Soapbox in December. In front of the projection, a "collaborator" performed an improvised Dorito-eating action, ending in a loud purge in the space's adjacent bathroom. There was another performance and the event ended. I went out drinking with the other artists- we found out that one of the artists and I had hooked up with the same guy. Eleanor told me that the name for that is "Eskimo Sisters." She and Eleanor are Eskimo Sisters as well, but they don't know that. I went home alone. At that time, I was flirting with a small binge/purge interest. The media was all over Adrian's 25 day hunger strike, and face-forward in the toilet I couldn't stop thinking of him either. I was really moved by the apparent futility of his action- putting out a demanding physical endurance as pure activism, but beginning right before December Holidays. Eleanor was in a group show I organized at a dive gallery in March 2012. I'm continually excited by the forcefully diaristic statements in her 2D work, which pit sentimentality against the real and aggressive, and impressed with the translation of that work into a body-based practice. She performed in Soapbox in May 2012. I got in touch with Kunj when I invited all past Soapbox artists back to celebrate the first year in Soapbox at Blowout, a day-long performance festival I organized in June 2012. 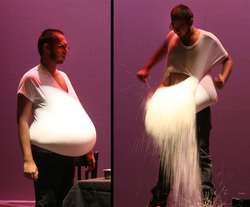 Of the 20-ish performances that day, Kool Raunch Collective turned the side gallery into a sweaty, greasy, meaty beach, Eleanor wrote a letter to her grandmother in potting soil, and we filled gluttonous Kunj's white tee with rice before a ritual disemboweling. I think about my direct involvement in the performances I curate, to what extent I affect the work, to what extent I am a co-author of the work in production. Curating performance requires trust, our professional and personal relationships form in tandem. In Control. 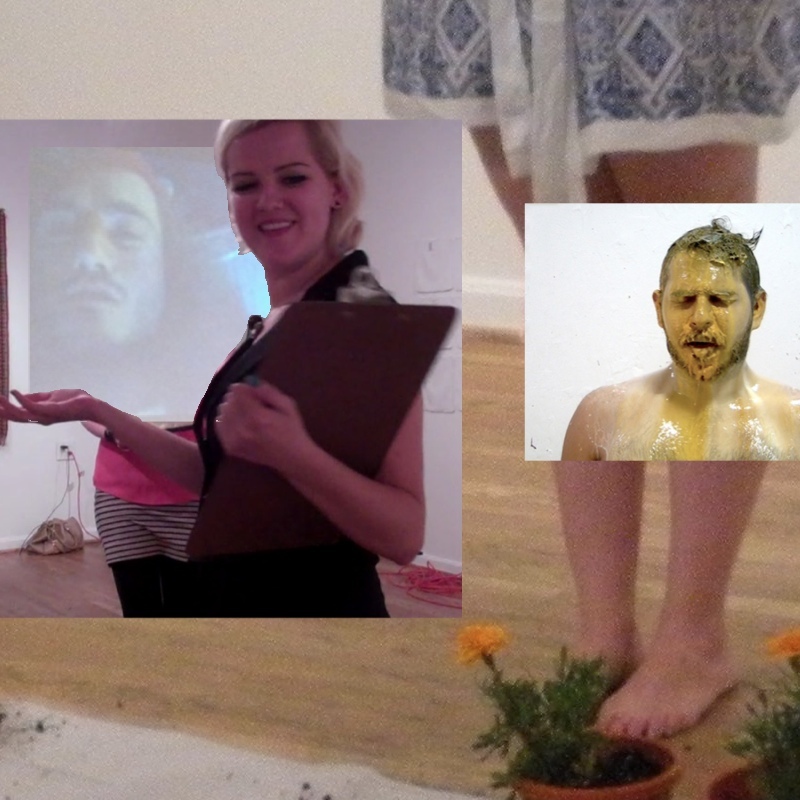 I invited each of the artists to make new work which involved me, a prompt and restriction.